One of our favourite ways to motivate ourselves to exercise is to take our pets with us, but sometimes even that can get a little dull when walking the same path, or running around the same oval, day after day! This year, make a resolution to mix up your exercise routine with your animals so you both can have some fun bonding and reaping the health benefits of physical exercise. Perhaps one of the most simplest and easiest ways to have fun when you exercise with your pets is to try a new location. This could be taking your dogs to the beach, on a hike, or to a new park you’ve been dying to find the time to go to. Instead of leading your animal, let your dog do all the steering and see where you end up. If you are in a secure location and your dog is highly responsive when called, let them off the leash and see where they wander. Otherwise, just hold the leash a little looser and let them wander at their free will. You may be surprised where you go! Most dogs love to run, so why not get fit and have them join in too. It doesn’t matter where you go, or if you choose a long distance run or some fast sprints across the oval. They will love to chase you and will push you to run harder and faster! If you do choose sprinting, make sure your pet follows you by giving them a treat and showing them the second treat to encourage them to chase you. We guarantee they will follow you! We all know dogs love to chase the ball at the park, so why not chase it with them? Throw the ball at a large distance and try and sprint to beat them to the ball. Do that 10 times and you’ve added a great high intensity workout into your routine for both you and your pet. This killer exercise is so great! Stair climbing gets your heart beating while working your legs and glutes. This exercise is also great for high-energy dog breeds who don’t get satisfied at the park. Why not choose stairs near a beach so you can work out, and then both of you can cool down in the ocean afterwards? As the hot weather is well and truly here, going swimming will exercise you and your pet and cool you down as well. You can play fetch in the water, or bring along a friend and play piggy in the middle with your dog who will love to chase the ball! 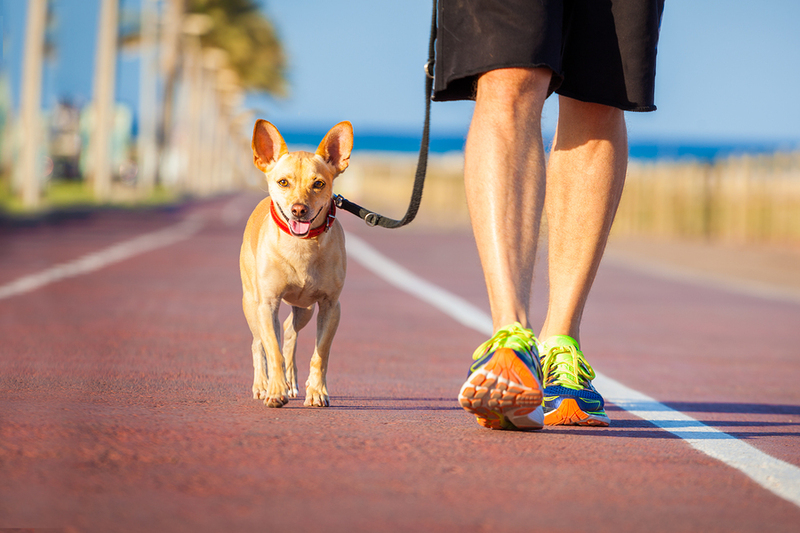 What kind of exercise do you do with your pets? Share your favourite activity with us on Facebook!